The Torroella de Montgri mountain is one of the distinctive features of the Costa Brava region. The mountain stands isolated and can be seen from as far away as Figueres. In the autumn when the birds are migrating south, they seem to use the mountain and the castle as a reference point before continuing their journey towards Africa. Torroella itself has an historic centre and at one time was an important port on the Ter, but as the bay of Pals silted up and land was reclaimed, contact with the sea was lost. Now you have to go to L'Estartit to reach the sea. The mountain itself separates the bay of Pals to the south - a long long sandy beach that stretches down to Begur, and to the north the bay of Roses/Escala. Montgris itself is a very rocky mountain and to reach the tower on the top you have to walk (I once tried to drive and got the car stuck because I had to reverse down the narrow gravel lane that I thought would go all the way up). The walking though is relatively difficult - the mountain is dry and the large stones slip and roll under foot or penetrate all but the sturdiest soles (of the shoes). It's definitely not a walk for flipflops. The walk itself starts by St Gregory school - this is a private Catholic school in Torroella which apparently has a good reputation and is popular with ex-pats. The path is sign-posted and you immediately climb off the road and onto the path above. The walk is hilly and steep. It broadly has two parts the first part up to a ridge past a hermit's house. At the top of the ridge is a small cross. On one side you can look South towards Palamos and Platja d'Aro in the distance and to the other side look North towards Figueres and the French border. The main path up to the tower is something of a long scramble from the ridge to the top - even more rocky that the lower part of the walk. The path zig-zags up and at time is difficult to keep track of what is path and what is just scattered rocks. Eventually it reaches the top and plateaus out. The tower itself sits on a broad flat area but with little vegetation. There is the remains of an old cistern cut into the rock to try to provide water but it is generally dry and barren. If there is a wind blowing you will definitely feel it since the area is very exposed. The climb up can make you quite hot and sweaty, but outside warmer parts of the year take a jacket to keep out the draft. 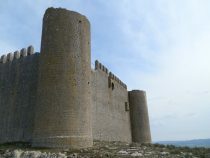 You can go into the tower and climb the walls, though there is little here apart from the walls themselves. The plaque describing the tower's history says it was abandoned before being fully finished. The views though can be amazing. Ideally pick the clearest day you can find. You can look across the plains towards the Pyrenees in the distance. The walk down is pretty much the same as the walk up. 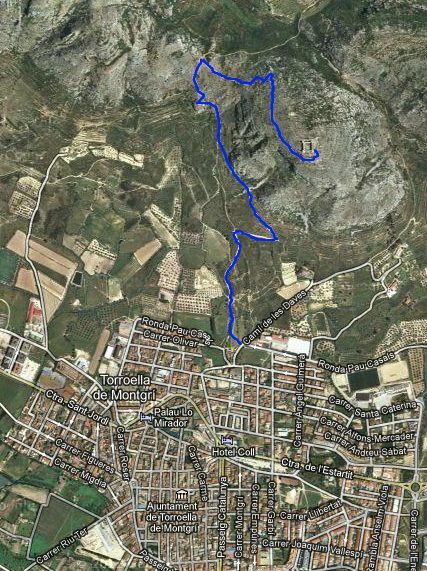 There are alternative routes but be aware that if you do walk down the other side, it's a relatively long way to reach a main road to get back to Torroella.